In the mornings, Marie Antoinette preferred coffee or hot chocolate, sometimes accompanied by simple bread. The bread she ate was possibly kipfel, a type of Austrian bread which is considered an early form of the croissant or it may have been an earlier form of kaisersemmel, more commonly known today as a Kaiser roll. Although popular legend has it that Marie Antoinette brought the croissant to France from her native Austria in the form of comfort food, this is likely a simple legend, because the croissant was not mentioned in records of French cuisine until the mid 19th century. 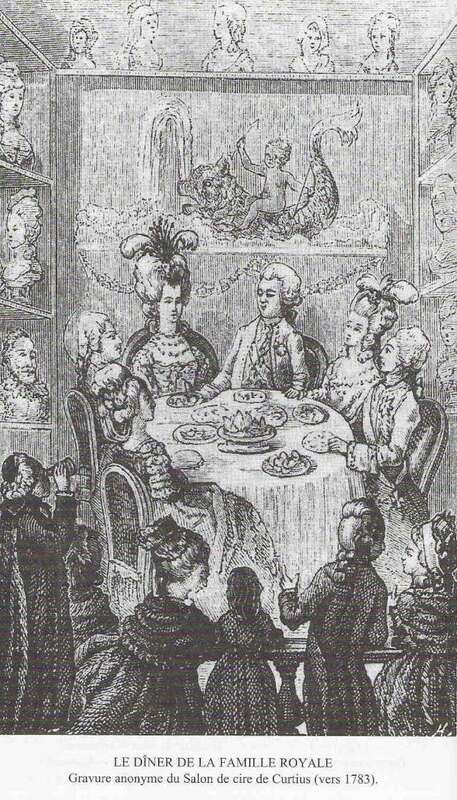 When Marie Antoinette was obliged to dine in public, which was the custom for the royalty at Versailles, she hardly touched the food presented to her. Typically, the food served during these ceremonial meals were elaborate court dishes which were meant to illustrate the majesty and wealth commanded by French monarchy. Although her husband ate at these public meals with gusto, Marie Antoinette often waited until she was able to retreat to her private apartments to eat her meals.